Boston University has produced a marvellous article/video package about TKOLS. You can read and view here. The Mystery Writers of America has short-listed The Killer of Little Shepherds for their annualEdgar Allen Poe Award, in the non-fiction category. Nice interview with “The Browser,” A British literary website. The editors ask authors to recommend five books related to their own, with provocative results. Read here. Jan. 5 interview on the Leonard Lopate show, WNYC-FM public radio. Listen here. Library Journal names TKOLS to its best seller list of 2010. German language rights to The Killer of Little Shepherds have been acquired by Riva Verlag, a prestigious German publisher that also is publishing Accidental Billionaires, the book on which the film, “The Social Network” was based. Fascinating interview and associated website from Radio Boston, at NPR affiliate WBUR-FM. Thanks to host Sacha Pfeiffer and producer Jessica Alpert. Listen & view here. John Batchelor (WABC-AM and affiliates) focused his interview on comparing Dr. Alexandre Lacassagne with his fictional counterpart, Sherlock Holmes. Listen here. 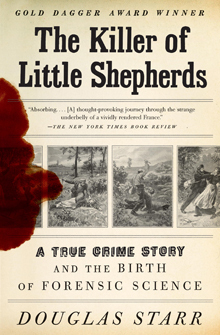 The New Yorker praises The Killer of Little Shepherds as “engrossing and carefully researched.” Complete review here. Full-hour interview on Kerri Miller’s Minnesota Public Radio show, Midmorning. Listen here. Excellent interview with Marco Werman, of Public Radio’s “The World.” Marco’s a smart and witty host, and we had a lively and fun conversation. You can download the podcast and see a short video here. New York Times names TKOLS to its “Editor’s Choice” list. New York Times Sunday Book Review calls The Killer of Little Shepherds, “Absorbing…thought-provoking.” Read complete review. METRO newspaper chain names TKOLS one of five “Big Books” for the fall. Chronicle of Higher Education author Evan Goldstein writes about The Killer of Little Shepherds in the October 1 edition: “Douglas Starr’s gripping non-fiction narrative…juxtaposes Vacher’s crimes and punishment with an account of how science began to grapple with issues of morality, insanity and culpability.” Read the article here. The Killer of Little Shepherds is selected for the Book-of-the-Month Club, Mystery Guild and Scientific American Book Club. British publisher Simon & Schuster UK Ltd has purchased rights for UK, Autralia, New Zealand and South Africa. UK publication in March 2011.